As some of you may know, we’re in Election Season, and Election Day is right around on the corner: Tuesday, Nov. 6, to be exact. This election presents many interesting choices and some choices that directly affect us as students at Cal (Prop. 30, we’re looking at you). We thought it would be helpful to put together a list of some resources to help you understand the various state proposition and city measures and help you find where you can vote. First off – where to vote … this is important for a variety of fairly self-explanatory reasons. 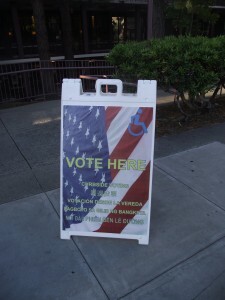 If you don’t know where to vote, head over to the Alameda County’s My Voter Profile . Just put in your street address and date of birth, and you’ll get information about your polling place. Secondly – there are 11 state propositions on the ballot. We think KQED’s California Proposition Guide  can help you understand what’s going on. We’d like to note that if both Propositions 30 and 38 are passed, only the one with more votes will go into effect. Thirdly – city measures … you’ve probably heard of Measure S about people sitting on the streets. It turns out there are 10 measures on the ballot for the city of Berkeley. You can find more information here . This list is not comprehensive, so we’d love for you to add resources we may have missed. And remember to vote on Tuesday, Nov. 6. You’re vote will help answer questions of ranging from national to local importance.